Love for Cutlery | 山崎金属工業株式会社 / YAMAZAKI KINZOKU KOGYO Co.,Ltd. The cutlery we created have earned trust and support from first class hotels and restaurants around the world. We have overcome numerous challenges before we became capable of delivering products of reliable quality. Here we are going to share with you how our corporate culture was born and promoted. Birth Place– Tsubame City known for “One and Only” craftsmanship. Birth Year – 1918 We were born in Tsubame City, Niigata Prefecture which is highly reputed globally for its “One and Only” craftsmanship in metal cutlery manufacturing. Our founder, Bungen Yamazaki, after mastering the technique of producing hand-hammered copperware, opened his own workshop to produce spoons. During that era, we shipped our products made of brass, copper, nickel-silver to Yokohama and Kobe where many foreigners resided. Soon thereafter, we evolved into a maker of metal cutlery made with machines and the business grew, allowing us to begin exports to Europe, the birthplace of metal cutlery. In 1926, cutlery was made primarily of stainless steel in Europe. We pioneered the importing of materials from Sweden for making cutlery, enabling us to strengthen our association with Europe. Dramatic Turning Point– The past challenges led us to our own style of craftsmanship. In the early 1950s, large American cutlery manufacturers rushed to outsource their production to Japan, much to our excitement. But the huge US cutlery market became quickly flooded with high quality Japanese products, leading to voluntary export control to ease the trade friction between the two countries. After the “Plaza Accord” in 1985, the Yen was progressively revaluated against US Dollar, making Japan’s export industries less competitive and they suffered a sharp decline in export volume. We learned we would have no future unless we overcame the currency gap by manufacturing products with high value-added. “We were determined to produce cutlery with quality that could not be duplicated by our competitors.” Thus, our answer was “Ultimate excellence in quality”. We conducted thorough market research in Europe, especially France and Germany, well known for being forerunners in craftsmanship handling metals in particular. Because we wanted to be strategically right with our directions and adept at European consumers taste for design and quality of tableware in general. In 1967, we started exploring the possibility of channeling our sales directly into the global market. In other words, we circumvented export brokers and established direct business relationships with overseas customers. The challenge was seeking potential buyers of our products on our own. Looking forward, we traveled to 65 countries. By making cold calls to various trade organizations and high-end department stores in order to conduct thorough market research, we slowly but surely increased the number of customers. Through such tireless efforts, we developed a sales network around the globe. Finally, we were recognized as a reliable cutlery company by a German silverware maker known for its 140 year history as well as world leading Danish and French brands. As a result, we were invited by those companies to develop new cutlery in collaboration. It was 1980 when we made a major step forward. We founded our own distribution company on Madison Avenue in New York City. We learned quickly in the American market the importance of design and marketing. For instance, we solicited three famous fish restaurants in Miami, Boston, and Seattle where celebrities dine to use our uniquely designed cutlery to promote our name and products. Among a series of our cutlery designs developed, a one-of-a-kind cutlery in the shape of fish made a splash in the marketplace. 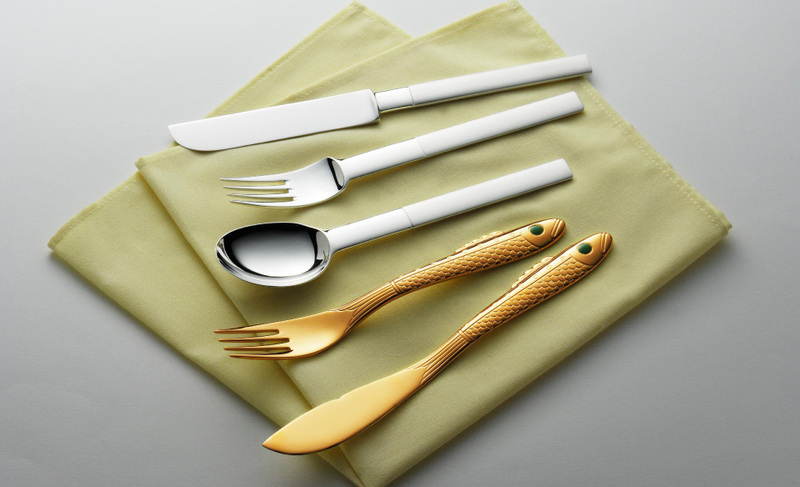 Over the past twenty years in the US, the fish cutlery has been the best seller in our collection. Our unique marketing idea of offering products with an appeal of taste, size and fashion trends unique to specific markets was embraced by customers and helped allow our brand to become deep-rooted in America. Decorating the Nobel Prize winners banquet tables– Our cutlery earned world recognition. In December 1991, our cutlery was proudly laid on the banquet tables for the Nobel Prize 90th Anniversary Award Ceremony in Stockholm. It was a triumphant moment when our business endeavors in America and Europe and our reputed craftsmanship were duly recognized. It began with the collaboration between a world known cutlery maker and a designer in Sweden. We had been in business association with Mr. Gunner Cyren, the designer appointed by Nobel Foundation for over 30 years. We earned his trust during those years by finding ways to form his demanding designs into the finished product. Thanks to his strong support, we were nominated to be the cutlery maker for the Nobel event and eventually formally commissioned. The Nobel Foundation evaluated us comprehensively from the viewpoint of our design sense, marketing concept, ability to coordinate overall table setting etc. We spent four years pursuing and developing a cutlery of uncompromising design and quality. After successfully completing the Nobel cutlery project, we continued our collaborations with various companies and institutions both domestically and internationally. Recently, we developed a tableware set in commemoration of the 20th year anniversary of the transfer of The Grand Shrines of Ise. Our special cutlery pattern decorated the dining tables on the cruise train “Seven Stars in Kyushu”, as well as many other accomplishments. Our motto is move forward and overcome challenges facing us. Our goal is to vigorously expand our territory. As lifestyles evolve, our mission is to explore new possibilities to connect objects to people. We would like to shape the company’s future on top of our treasure trove of experience.